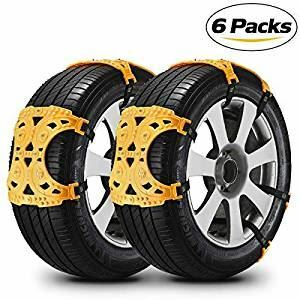 Fittign snow chains to your car is only recommended for the most extreme situations and it will have a serious impact om how your drive your car. You'll need to drive much, much slower with snow chains fitted and won't be able to get much above 30mph. 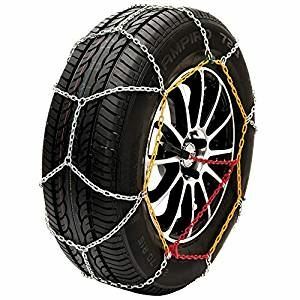 Listed below are our pick of those snow chains that can be used in the United Kingdom in conditions where there's heavy snow of thick ice. They're far more common in Europe, particularly in ski resorts, where there's often regular snow to contend with. You should bear this in mind if you're driving to Europe during the Winter. 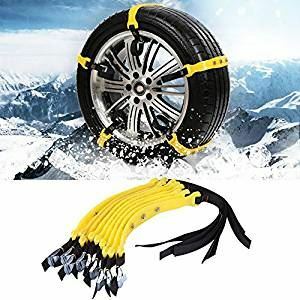 France, Germany and Sweden make it mandatory to carry snow chains and if visiting Switzerland, Norway, Italy, Austria, and Andorra, you should have some in the boot just in case. These universal snow chains from DINOKA give maximum versatility to the user, as they not only fit a wide variety of vehicles but are also suitable for use in mud and sand as well as snow. 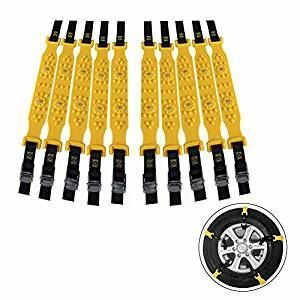 With six chains included in the pack you can distribute the chains across the wheels of your car as you see fit, and gloves, the installation tool, manual and a shovel are included. As well as snow socks Sumex offers a broad range of snow chains, which are capable of dealing with more challenging conditions and have a longer life. 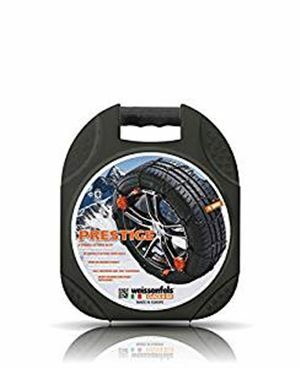 Available in 15 different sizes to suit wheel sizes from 13-inches to 20-inches, the package includes two chains, a storage case and plastic gloves for clean installation. These sturdy snow chains from KONIG come in a pair and are fitted with a simple manual tensioning device, making them quicker to fit and easy to adjust to fit perfectly. Available in a choice of 14 sizes to suit a variety of wheel sizes, these chains also come with TUV approval. 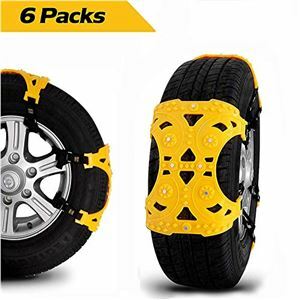 This offering from Qomolo takes the multi-piece approach to snow chains, coming in a pack of six or eight sections that you can distribute across your wheels depending on your needs. 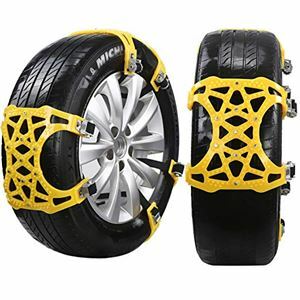 Each section has studs and steel spikes for good grip and is designed to be used with alloy wheels without scratching. 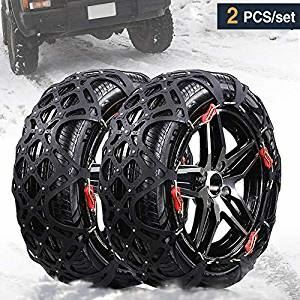 If looks are anything to go by these snow chains from Rupse appear ready to tackle anything. 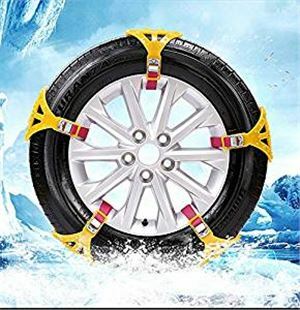 Available in wide or extra wide sizes, these chains are a mix of high-grade plastic and rubber, with multiple studs moulded in to give strong grip on snow and ice. The kit includes an instruction manual and installation tool, as well as fabric gloves and a shovel to get you out of sticky situations. Designed for emergency use, these snow chains from Zerone are quick to install and come in a pack of ten, allowing you to distribute the belts around your wheels depending on the conditions and the type of vehicle you own. Each belt is fitted with alloy studs to improve traction and is adjustable, so they can fit tyre widths between 185mm and 225mm. Another snow chain set that comes in a pack of 10, this offering from Lamptti allows you to give the added traction to the wheels that need it most or divide them up amongst all four wheels to suit your preference. Each strap is made from tough rubber, lined with spikes and with steel studs inset to give maximum traction. As well as snow socks the German brand Weissenfels also offers these sturdy snow chains, charmingly named ‘Clack&Go’. 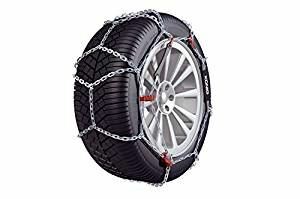 Available in 14 sizes to suit just about any wheel and tyre combination, these chains are far from cheap but they are suited to European countries where it can be a legal requirement to carry chains in winter months. This set of chains from MASO comes in packs of six and ten as well as eight (priced accordingly) so you can choose a pack to suit your needs. Compatible with tyre widths between 165mm and 285mm, the chains are made from tough polyurethane with steel studs to increase grip. Each set comes with a pair of gloves and a storage bag, and the smart design means you don’t need to move the vehicle to fit them. Unitify’s snow chain offering takes the popular approach of strong individual straps across the tyre, with a choice of six or eight straps depending on the pack size. Each one has moulded and steel studs across the surface to improve traction, and the pack includes the fitting wrench to ensure a snug fit. A pair of gloves, instructions and a storage bag also come with the set.